Leeson 174944.00 AC Inverter 2HP 1.5KW 3PH 480/590V 50/60Hz 3.3A ! WOW ! It will provide power for a 220v - 3phase motor rated between 3 HP and max of 10 HP. Model number is SC10. This is a new static phase converter unit that can be used to power a milling machine, drill press, lathe or any easy to normal starting load. 1 - 3 Hp Heavy Duty Static Phase Converter MILL SAW DRILL LATHE Made in USA SCX03 single to three phase. Bandsaw ( beltdrive ) Milling Machine. Static start phase converters are designed to start a 3 phase motor from single1 phase power. 8 to 12 HP STATIC PHASE CONVERTER. Bench grinder. Chop saw (1HP & under). Thickness planer. Product Line: STATIC WAVE. Table saw (2HP & under) Band saw (belt drive). Drill press (2HP & under). Min/Max HP (LOAD): 8 to 12. It will provide power for a 220v - 3phase motor rated between 1 HP and max of 5 HP. Model number is SC05SW. This is a new static phase converter unit that I can be used to power a milling machine, drill press, lathe or any easy to normal starting load. With this setup you will have a 5 hp rotary phase converter, your 5 hp motor should be rated at 230volt or 230/460volt and a rpm of 17XX or 34XX. dual run capacitor circuit. 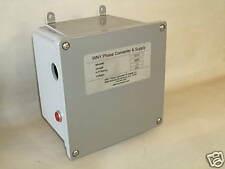 Heavy duty start capacitor rated at 250vac. 4 to 8 HP STATIC PHASE CONVERTER. Bench grinder. Chop saw (1HP & under). Thickness planer. Product Line: STATIC WAVE. Table saw (2HP & under) Band saw (belt drive). Drill press (2HP & under). Radial arm saw. Runs 1/3 TO 3/4 HP 220 vac 3 phase motors on 220 vac single phase power. Uses include: Lathes, Mills, Grinders, Drills, Saws, Metal working and Woodworking equipment, Printing Machines and Equipment, Sewing Machines, Garbage Disposals, Food Processing Equipment, Meat Grinders, Dough Mixers, Food Blenders, Elevator Belts, and numerous other uses. 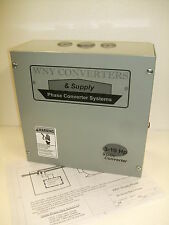 3/4 to 1 1/2 HP STATIC PHASE CONVERTER. Bench grinder. Chop saw (1HP & under). Thickness planer. Product Line: STATIC WAVE. Table saw (2HP & under) Band saw (belt drive). Drill press (2HP & under). Radial arm saw. Runs 1 TO 3 HP 220 vac 3 phase motors on 220 vac single phase power. Uses include: Lathes, Mills, Grinders, Drills, Saws, Metal working and Woodworking equipment, Printing Machines and Equipment, Sewing Machines, Garbage Disposals, Food Processing Equipment, Meat Grinders, Dough Mixers, Food Blenders, Elevator Belts, and numerous other uses. (New single to three phase converter / starter / dephaser. Specifications: 3-5 HP, 208-250 VAC, 60/50HZ. 4) POWER and START indicators (turn off if not in use to extend life and save energy). The Copper traces on the PCBoard are double sided (top and bottom layers) and extra wide to easily handle current demands. With this setup you will have a 7 1/2 hp rotary phase converter, your 7 1/2 hp motor should be rated at 230volt or 230/460volt and a rpm of 17XX or 34XX. 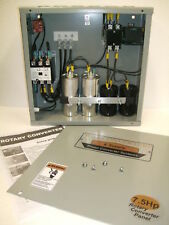 Rotary Phase Converter Panels. Rotary Phase Converters. Runs 3/4 - 1 1/2 HP 220 vac 3 phase motors on 220 vac single phase power. Uses include: Lathes, Mills, Grinders, Drills, Saws, Metal working and Woodworking equipment, Printing Machines and Equipment, Sewing Machines, Garbage Disposals, Food Processing Equipment, Meat Grinders, Dough Mixers, Food Blenders, Elevator Belts, and numerous other uses. Trending at C $221.39eBay determines this price through a machine-learned model of the product's sale prices within the last 90 days. 3 - 5 Hp Heavy Duty Static Phase Converter MILL SAW DRILL LATHE Made in USA SCX05. Each part can be replaced individual or as a group. SCX01, SCX03., SCX05. Static start phase converters are designed to start a 3 phase motor from single1 phase power. With this setup you will have a 3 hp rotary phase converter, your 3 hp motor should be rated at 230volt or 230/460volt and a rpm of 17XX or 34XX. Rotary Phase Converters. Rotary Phase Converter Panels. (New single to three phase converter / starter / dephaser. 2) Bigger reinforced capacitor for smoother starts & longer life. If rotation is not correct, cut power, reverse L1 and L2 and retest. The Copper traces on the PCBoard are double sided (top and bottom layers) and extra wide to easily handle current demands. Fiber Converter MM/LC 2CH 100Mb. range of product: Modicon X80 - product or component type: fibre optic repeater - optic fiber type: multi mode. o Contents: 1 FIBER OPTIC CONVERTER. o Depth: 86 mm. o Height: 100 mm. Runs 7.5 HP 220 vac 3 phase motors on 220 vac single phase power. Uses include: Lathes, Mills, Grinders, Drills, Saws, Metal working and Woodworking equipment, Printing Machines and Equipment, Sewing Machines, Garbage Disposals, Food Processing Equipment, Meat Grinders, Dough Mixers, Food Blenders, Elevator Belts, and numerous other uses. With this setup you will have a 15 hp rotary phase converter, your 15 hp motor should be rated at 230volt or 230/460volt and a rpm of 17XX or 34XX. Rotary Phase Converter Panels. Rotary Phase Converters. It will provide power for a 220v - 3phase motor rated between 3 HP and max of 5 HP. Model number is SC05. This is a new static phase converter unit that I can be used to power a milling machine, drill press, lathe or any easy to normal starting load. Runs 2 HP 220 vac 3 phase motors on 220 vac single phase power. Uses include: Lathes, Mills, Grinders, Drills, Saws, Metal working and Woodworking equipment, Printing Machines and Equipment, Sewing Machines, Garbage Disposals, Food Processing Equipment, Meat Grinders, Dough Mixers, Food Blenders, Elevator Belts, and numerous other uses. 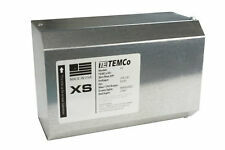 (New single to three phase static converter / starter / dephaser. 2) Bigger reinforced capacitor for smoother starts & longer life. The Copper traces on the PCBoard are double sided (top and bottom layers) and extra wide to easily handle current demands. Runs 1 HP 220 vac 3 phase motors on 220 vac single phase power. Uses include: Lathes, Mills, Grinders, Drills, Saws, Metal working and Woodworking equipment, Printing Machines and Equipment, Sewing Machines, Garbage Disposals, Food Processing Equipment, Meat Grinders, Dough Mixers, Food Blenders, Elevator Belts, and numerous other uses. Specifications: 4-8 HP, 208-250 VAC, 60/50HZ, IP65 ( Able to protect against water jets). 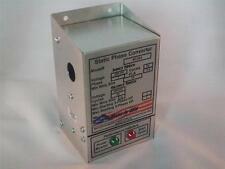 New single to three phase static phase converter / starter / dephaser. The Copper traces on the PCBoard are double sided (top and bottom layers) and extra wide to easily handle current demands. Runs 12 TO 18 HP 220 vac 3 phase motors on 220 vac single phase power. Uses include: Lathes, Mills, Grinders, Drills, Saws, Metal working and Woodworking equipment, Printing Machines and Equipment, Sewing Machines, Garbage Disposals, Food Processing Equipment, Meat Grinders, Dough Mixers, Food Blenders, Elevator Belts, and numerous other uses. Runs 20 TO 30 HP 220 vac 3 phase motors on 220 vac single phase power. Uses include: Lathes, Mills, Grinders, Drills, Saws, Metal working and Woodworking equipment, Printing Machines and Equipment, Sewing Machines, Garbage Disposals, Food Processing Equipment, Meat Grinders, Dough Mixers, Food Blenders, Elevator Belts, and numerous other uses. 3/4 - 5 Hp Heavy Duty Static Phase Converter MILL SAW DRILL LATHE Made in USA. Bandsaw ( beltdrive ) Milling Machine. Static start phase converters are designed to start a 3 phase motor from single1 phase power. Runs 8 TO 12 HP 220 vac 3 phase motors on 220 vac single phase power. Uses include: Lathes, Mills, Grinders, Drills, Saws, Metal working and Woodworking equipment, Printing Machines and Equipment, Sewing Machines, Garbage Disposals, Food Processing Equipment, Meat Grinders, Dough Mixers, Food Blenders, Elevator Belts, and numerous other uses. 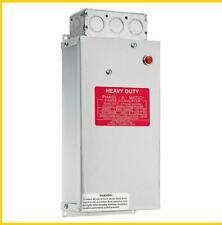 Runs 4 - 8 HP 220 vac 3 phase motors on 220 vac single phase power. Uses include: Lathes, Mills, Grinders, Drills, Saws, Metal working and Woodworking equipment, Printing Machines and Equipment, Sewing Machines, Garbage Disposals, Food Processing Equipment, Meat Grinders, Dough Mixers, Food Blenders, Elevator Belts, and numerous other uses. Trending at C $361.22eBay determines this price through a machine-learned model of the product's sale prices within the last 90 days. Instant reversing. Runs more than one machine. Application • Runs more than one machine. Can operate 2 speed motors. Horsepower 3 ~ 5. Model# PC-600. Runs 3 - 5 HP 220 vac 3 phase motors on 220 vac single phase power. Uses include: Lathes, Mills, Grinders, Drills, Saws, Metal working and Woodworking equipment, Printing Machines and Equipment, Sewing Machines, Garbage Disposals, Food Processing Equipment, Meat Grinders, Dough Mixers, Food Blenders, Elevator Belts, and numerous other uses. Runs 10 HP 220 vac 3 phase motors on 220 vac single phase power. Uses include: Lathes, Mills, Grinders, Drills, Saws, Metal working and Woodworking equipment, Printing Machines and Equipment, Sewing Machines, Garbage Disposals, Food Processing Equipment, Meat Grinders, Dough Mixers, Food Blenders, Elevator Belts, and numerous other uses. Runs 10 HP 460 vac 3 phase motors on 460 vac single phase power. Uses include: Lathes, Mills, Grinders, Drills, Saws, Metal working and Woodworking equipment, Printing Machines and Equipment, Sewing Machines, Garbage Disposals, Food Processing Equipment, Meat Grinders, Dough Mixers, Food Blenders, Elevator Belts, and numerous other uses. 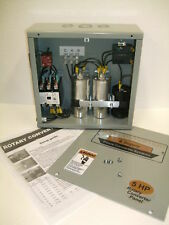 Runs 3 HP 460 vac 3 phase motors on 460 vac single phase power. Uses include: Lathes, Mills, Grinders, Drills, Saws, Metal working and Woodworking equipment, Printing Machines and Equipment, Sewing Machines, Garbage Disposals, Food Processing Equipment, Meat Grinders, Dough Mixers, Food Blenders, Elevator Belts, and numerous other uses. For sale is a SIMCO Sentury Static Elimination Air Blower P/N 4003000. This blower powers on and appears to be fully operational. The faceplate is ajar. Instant reversing. Runs more than one machine. Application • Runs more than one machine. Can operate 2 speed motors. Weight 3 lbs. Horsepower 1 ~ 3. Model# PC-300-HD. Runs 3 HP 220 vac 3 phase motors on 220 vac single phase power. Uses include: Lathes, Mills, Grinders, Drills, Saws, Metal working and Woodworking equipment, Printing Machines and Equipment, Sewing Machines, Garbage Disposals, Food Processing Equipment, Meat Grinders, Dough Mixers, Food Blenders, Elevator Belts, and numerous other uses. Instant reversing. Runs more than one machine. Application • Runs more than one machine. Can operate 2 speed motors. Horsepower 3/4 ~ 1-1/2. Model# PC-200-HD. Runs 30 TO 50 HP 220 vac 3 phase motors on 220 vac single phase power. Uses include: Lathes, Mills, Grinders, Drills, Saws, Metal working and Woodworking equipment, Printing Machines and Equipment, Sewing Machines, Garbage Disposals, Food Processing Equipment, Meat Grinders, Dough Mixers, Food Blenders, Elevator Belts, and numerous other uses. Instant reversing. Runs more than one machine. Application • Runs more than one machine. Horsepower 4 ~ 8. Model# PC-900. Instant reversing. Runs more than one machine. Application • Runs more than one machine. Can operate 2 speed motors. Weight 3 lbs. Horsepower 1 ~ 3. Model# PC-300.